Ostindo International Pty Ltd - Philippine Cuisine - Lucky Me! Philippine Cuisine - Lucky Me! Home -> Our Brands -> Philippine Cuisine -> Lucky Me! "Innovative, nutritious, and family oriented"
Lucky Me! The leading brand for instant noodles in the Philippines, has over the years found its way into our homes, schools and offices by providing delicious and quick meal solutions for busy people. 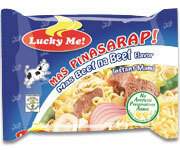 While catering to the Filipinos discriminating palate, the range of Lucky Me! products addresses the ever changing need of the Filipino consumer. The result: convenience, flavourful meals that are fuss free, fortified with vitamins & minerals and no artificial preservatives added. The closest thing to authentic Nilagang Baka (slowly boiled beef brisket) with a mix of potatoes and cabbage. Noodle goodness that captures the true taste of chicken - delicately boiled, light and yummy. Lite up your life! with Special by Lucky Me! Sotanghon Lite. Low-fat and cholesterol-free food never tasted this delicious and felt this filling. Warm, clear and light - the way life should be every day. Rich. Thick. Flavourful. That's the best way to describe Special by Lucky Me! Lomi. It captures Lomi's authentic taste with rich soup, thick noodles and flavourful seafood taste. Fire up your taste buds with an even spicier kick. Enjoy it with your friends for an extra exciting eating experience. Dare to try it! This is not for the faint of heart! Lucky Me! Supreme pays tribute to the classic delicacy, La Paz Batchoy. Complete with pork crackling and meat bits, Lucky Me! 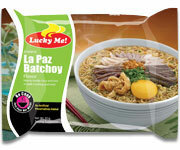 Supreme La Paz Batchoy lets you enjoy the taste of the Philippine South every day. A la eh! The undeniable taste of slow simmering beef meat, bones and marrow is captured in every cup of Lucky Me! Supreme Bulalo. Inspired by the Batangas specialty, and made with firm-to-the-bite noodles, you'll keep coming back for more.